Few artists can claim to have a more unlikely biography than Daniel Johnston. As a shy teenager, he began in the early Eighties to release cassette tapes recorded in the basement of his parents’ house. His squeaky voice and the veritable lo-fi charm made him soon come to the attention of rock icons like Kurt Cobain and Sonic Youth. Daniel Johnston, a tortured artist in the truest sense of the word, has been suffering from many mental ills that not always provided fortunate for his career. After one album release on a major label in the mid-Nineties, it was back to square one for this gifted songwriter who still didn’t give up. Now, thirty years after his first tapes, he’s a respected artist who still records new albums and willingly cooperates with other musicians. His excellent last studio album Is And Always Was came out not even half a year ago, making Beam Me Up! quite an unexpected surprise. The CD was recorded in November last year together with the eleven piece jazz ensemble B.E.A.M. Orchestra from the Netherlands. Collectors will be happy to find three previously unreleased tracks, although they are all solo efforts. The short Sarah Drove In Her Car which opens the album is an a cappella piece, while an electric guitar accompanies the vocals on Mask and Last Song. Otherwise we get three cuts from Daniel Johnston’s Mark Linkous collaboration Fear Yourself from 2003. These tracks were already perfectly arranged and therefore ideal to be reinterpreted by the Dutch ensemble. There are also the inevitable classics from the early days: True Love Will Find You In The End, Wicked World, Devil Town, Walking The Cow and The Beatles. These new versions all give a new life to these classics. The B.E.A.M. Orchestra sounds somewhat like a brass band, giving at times the impression as if Hazelwood signed Mardi Gras BB were Daniel Johnston’s backing band on Beam Me Up! 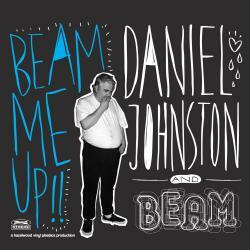 Newcomers have of course more suitable entry points into the vast sonic world of Daniel Johnston. Those already familiar with the aforementioned Fear Yourself and for instance a best-of compilation will be utterly delighted by these carnivalesque transformations. As a long time fan of the artist, I have no choice but handing the maximum rating for this totally successful collaboration.